I've been making my pumpkin waffles forever. With a sweet pumpkin flavor offset by warm fall spices, fluffy inside and crispy golden outside, they're an irresistible treat that are especially perfect at this time of year. I like to make a big ol' batch for family brunch gatherings over the holidays and freeze some for leftovers. They're great to pop in the toaster to make sandwiches layered with honey whipped cream cheese or with turkey and cranberry chutney the day after Thanksgiving. I made some last week and decided to take a few pics of them. As good as they look here, I promise you they taste even better. Try making them for your guests this weekend -- they will not disappoint! 2. Sift first 7 ingredients into a bowl. 4. Whisk the dry ingredients into the liquid mixture and whisk until smooth. 5. 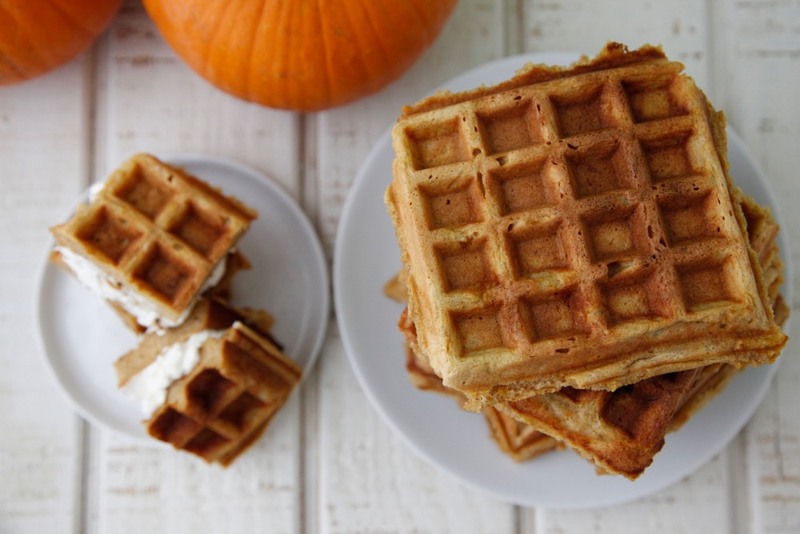 Pour about 1/2 cup of the pumpkin batter into a waffle iron that’s been buttered or greased and cook according to manufacturer’s directions. 6. Serve with maple syrup or make into sandwiches filling with cream cheese and whatever other fillings you desire. To Freeze: Allow to cool, place in a ziploc bag, label and freeze. When ready, place in toaster oven or oven at 300 and heat for 10 minutes or until heated through. We love these at our house--I've often made extra and frozen them. More than once they have saved me on those mornings when I'm late and can't find anything for breakfast! 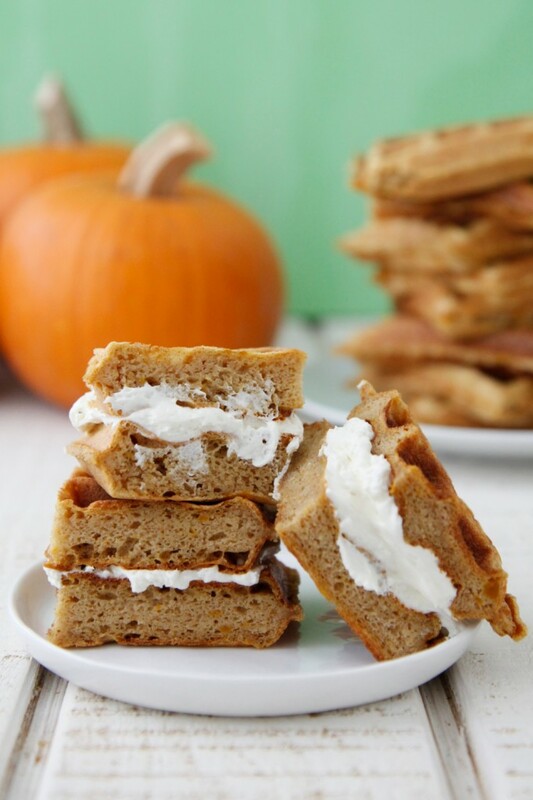 We got your pumpkin waffle recipe out of your first cook book and have been enjoying them for almost a year now. My 6 yr old loves to take them to school in his lunch box with just some syrup to dip into. I usually make them for snack for my daycare kids. There are always plenty to eat what we need then I freeze some and one of my daycare moms will take some home to her big kids. I now know this recipe from your book off by heart as I make it at least twice a week, but I see you have changed it to all buttermilk here. Does this make a difference to how they come out? I find that they dont crisp up for me as much as other recipes when I do half milk and half buttermilk. I still love them as do my kids, my husband and my super picky 12 year old brother. I originally did that because I figured the taste would be better for the little ones, but I now use all buttermilk when I make pancakes and waffles and I much prefer the results! Can I ask you what kind of waffle iron you use? Thanks for always posting amazing recipes! I love them. Can I ask what kind of countertops you have? We are renovating and my kids cook with me daily and I need something durable but pretty. And I love yours! Marble! :) it definitely has it's dings from wear and tear, but has held up nicely for the last 6 years! 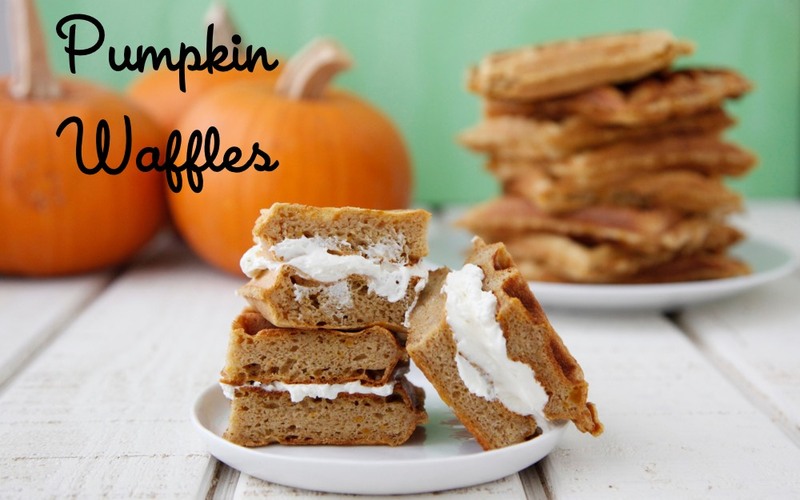 Oh pumpkin waffles! Perfect for Thanksgiving morning! I shared this on Facebook! Thanks! What a great way to kick off a day of great food! I just love these waffles. Perfect for fall, and the holidays. The third photo about did me in. Gorgeous. What waffle maker do you recommend? would it be possible to substitute the buttermilk for almond milk? Yes! You can use any type of milk! The \"Proctor Silex 26000 Belgian Waffle Maker\"------- is no available on amazon. Can you recommend a similar one that's easy to use and economical, easy to store/ cleanup ?